Growing up in a rural town in southwest India near the sea, author and chef Hari Nayak was thoroughly steeped in the aromas and flavors of traditional Indian cooking--the allure of freshly roasted and ground spices, simmering dals with fragrant curry leaves, creamy grated coconut and homemade yoghurt, the sour bite of the tamarind and the burn of hot chili peppers, the sweetness of sugar palm sap, fresh fish and seafood of every description--and hot, fluffy plates of steaming rice, the staple of most meals. 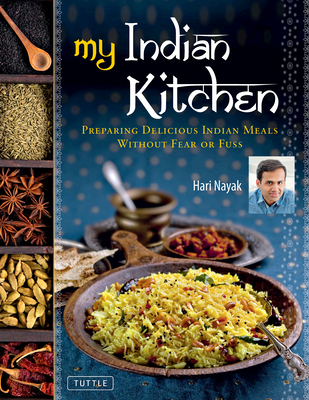 In this book Hari shares the secrets of his family's own style of southern Indian cooking as well as favorite dishes from other parts of the huge Indian subcontinent--secrets that he learned from his mother and aunts, neighbors, local street vendors and countless friends. Simple tips like quickly dry-roasting spices in a skillet before grinding them to a powder or a paste to release the oils and awaken the flavors, thereby adding a wonderful, almost alchemical aroma to any dish. This tip, and many more, will help you to unlock the "hidden magic" of Indian cooking. With the recipes in this book, you will finally be able to make consistently delicious Indian food for your friends and family--from a perfect Mint Chutney with Samosa to a melt-in-the-mouth Chicken Tikka Masala, Pork Vindaloo, Tandoori Chicken, Cucumber and Yogurt Raita and Sweet Mango Yogurt Lassi. Traditional Indian meals normally involve elaborate preparation, but Hari, having lived in the West for many years now, understands that most of us do not have the time to prepare elaborate meals, particularly during the work week. To accommodate our busy lifestyle, the recipes in this book have been simplified, without sacrificing any of their authenticity. An electric spice grinder (or food processor) replaces the traditional grinding stone and a blender replaces pureeing by hand. What if you don t have time to make homemade Indian bread? A crusty French baguette can be served instead. With Hari's guidance and timesaving tips, you'll learn how spices and herbs complement one another and interact with other ingredients to create the unique aroma and flavor in each dish. Armed with this knowledge, you will soon be able to create Indian meals appealing to suit your personal taste and that of your family and friends, creating your very own Indian kitchen.